Een Engelstalige cursus voor studenten aan de zeevaartschool en voor training aan boord. Tijdelijk niet leverbaar. U kunt hier uw mailadres achterlaten. Wij sturen u dan bericht zodra het boek weer leverbaar is. The International Maritime Language Programme (IMLP) is een goed opgezet Engelstalig boek aangevuld met een cd-rom. De diverse teksten, taken en opdrachten vormen samen met de cd een complete cursus voor het leren van het nautisch Engels zoals in het internationale scheepvaartverkeer wordt gebruikt. Het boek behandelt elk aspect van de zeevaart: maritieme communicatie, scheepskennis, techniek, navigatie, veiligheid, documenten, correspondentie en grammatica. Het cursusboek en de cd-rom zijn daarom geschikt om alle aspecten van communicatie te leren, zoals voorgeschreven in de "IMO International Convention on Standards of Training, Certification and Watchkeeping for Seafarers (STCW), 1978/95". Een must voor zeevarenden en studenten aan de zeevaartscholen. Voor meer informatie kunt u het beste ook de beoordeling van Prof. Dr. Peter Trenkner onder de 'tab Review' lezen. Als extra kunt u na het plaatsen van uw bestelling een presentatie over de toepassing van het International Maritime Language Programma in het VHF Marifoonverkeer downloaden. De presentatie is verpakt in een gecomprimeerde map (35 Mb) en bevat de presentatie in Powerpoint en als PDF. The International Maritime Language Programme (IMLP) is a well structured, English-monolingual textbook with diversified texts, tasks and projects, complemented and supplemented by a CD-ROM and reflecting an up-to-date content based communicative methodology of language teaching and learning. The IMLP has been designed for students at any level at Maritime Colleges and for on-board-training/ distant-learning programmes and covers every aspect of the seafaring world, reflecting an up-to-date content based communicative methodology of language teaching and learning. Of course the emphasis in the entire IMLP lies on VHF-Communication and the application and use of the Standard Marine Communication Phrases. 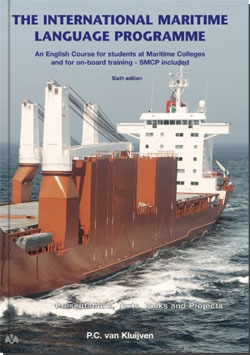 The course book and the CD-Rom are well suited to acquire the communication requirements as laid down in the relevant sections of the IMO International Convention on Standards of Training, Certification and Watchkeeping for Seafarers (STCW), 1978/95. Meanwhile it goes without saying within the shipping industry, that, whenever the "international maritime language" is referred to, Maritime English is meant. According to the STCW 1978/95, future deck and engineer officers have to render a well developed command of this specialised language, otherwise they will not be granted a certificate of competence as a great many accidents at sea and in ports use to happen due to communication deficiencies. English monolingual textbooks reflecting accepted standards in methodology and being abreast with current developments regarding the requirements on Maritime English in modern shipping are badly needed by teachers and students alike but still rarely found on the market. That is why P. C. van Kluijven's course is highly appreciated by the Maritime English community. The quite voluminous textbook comprises seven maritime fields, called units, of which the author rightly assumed that they would cover safety related and communicatively highly relevant facts, situations, processes, etc. : Maritime Communication, General Ship's Knowledge, Engineering, Navigation (incl. cargo handling), Safety, Documents and Correspondence. All these complexes are broken down into a number of related sub-areas witnessing the careful needs analysis the author has undertaken in this respect. It should be noted, however, that at least an intermediate level of English language competence is necessary to successfully cope with the requirements of the course. The methodical approach applied in the different units follows the principles of the so-called Content-based and Communicative Language Teaching. This is an effective and appropriate method of language instruction best suited for will-be seafarers to acquire the necessary communication competence for their prospective career on shipboard. It is noteworthy and appreciable that the course also includes the teaching/learning of the IMO Standard Marine Communication Phrases (SMCP) which to appropriately apply is one of the requirements of the STCW 1978/95 to ship's officers. The SMCP are embedded in a convincing and trade-related maritime context so that a boring, isolated rote learning of the phrases is avoided. At the end of each unit the learner is required to do a final project where s/he is expected to apply what s/he has learnt and to demonstrate the progress made in acquiring Maritime English proficiency. The accompanying CD-Rom is of great value as well. It doesn't merely attract students and cadets because they like to play PC anyhow, it is first of all a well thought out and made up multimedial means of instruction. It is not only perfectly suited for individualised group working of in the classroom, but also or an instructorless learning in private PC-assisted studies at whatever place. e.g. on board vessels. The last unit covers selected problems of practical grammar which foreign learners of English often feel hard to be properly mastered. This unit stands, however, somewhat isolated at the end of the textbook in "tow" of the other units, but not really "fastened" to them. Its various well selected grammatical items could probably better be dealt with when split and harboured in those preceding units in the language of which they appear as typical grammatical features, but this remark does in no way diminish the value of the course. Maritime English teachers would be well advised to assign this teaching/learning aid a prominent place in their daily work in classes, and when they wish or need to improve their maritime background knowledge, this course also offers valuable and easily understandable information in this respect.. It does not require much prophecy to foresee The International Maritime Language Programme a leading position in the convoy of Maritime English teaching aids. Peter C. van Kluijven is the author of the International Maritime Language Programme - IMLP, which has been adopted by the IMO as the standard for Maritime English Teaching & Learning purposes. He is also the author of the Dutch/English Lexicon Scheepvaart & Transport, and the co-author of the English/Dutch edition of the Standard Marine Communication Phrases. He is the author of the multi-lingual International Maritime English Dictionary, which covers the translations of Maritime English words and phrases into the 10 key-languages in the maritime- and shipping industry: Filipino, Spanish, Chinese, Russian and Arabic (IMD - PART 1), and French, German, Polish, Romanian and Croatian (IMD - PART 2). He has been a member of The International Maritime Lecturers' Association - IMEC (International Maritime English Conference) and has been involved in organizing the world-wide IMEC Conferences in Asia, Europe and the Arabic continent for more than a decade now. Levering was netjes, product op tijd en in goede orde ontvangen. Enige puntje is dat er staat aangegeven dat het om de 3e druk gaat, terwijl ik in werkelijkheid de 7e druk heb ontvangen. Dit is achteraf gezien alleen maar beter, aangezien tussen de 3e en 7e druk erg veel is veranderd. Vaarwinkel: Mogelijk was dat een tikfout. ISBN Nummer is namelijk wel van de 7e druk. Excuus en is aangepast. I have just received the book (with included CD). It's just absolutely great. Thank you very much.